The holiday season is almost here, and if you have been thinking about getting a new device to put under the tree for a loved one, or considering picking up a little something for yourself if the price is right, Microsoft is offering a wide array of attractive deals on their own wares and devices from their OEM partners. The sale goes live at 12 AM EST on November 26th, but you can preview their Black Friday deals before it officially commences on Thanksgiving. Below is a roundup of the best Black Friday deals which will be available a little later this week. There are some definite bargains on Microsoft devices and services. If you have been contemplating the Surface 3, you will be able to save $150 on the Surface 3 + Type Cover combo. The Type Cover itself usually retails at $130, so for Black Friday’s sale you are essentially getting the Type Cover for free plus a little off the normal price of a Surface 3. You can also save up to $200 on a Surface Pro 3 which is a great deal on Microsoft’s best selling 2 in 1 hybrid. That is if the $200 savings is worth more to you than the new features in the Surface Pro 4 like a new stylus and a facial recognition camera that allows you to login without touching your device. Microsoft is also offering new subscriptions for Office 365 with a savings of $50, a discount of 50% off. But there are also some exceptional deals on PCs made by Microsoft’s OEM partners. All of the OEM made PCs sold by the Microsoft Store come as Microsoft Signature Edition PCs, meaning they are more secure and free of bloatware in order to improve performance and stability. The list of laptops and all in one PC’s is pretty extensive and includes PCs made by Dell, HP, Acer, Asus, Samsung, LG, Toshiba, and Lenovo. Two really good deals in terms of dollars per performance are the Dell Inspiron 15 i5558-5718SLV Signature Edition Laptop and the HP Pavilion 15-ab292nr Signature Edition Laptop. Both come with 8GB of memory, 1TB of storage, 15 inch Full HD touchscreens, and i5 processors (but from the Haswell generation). The Dell will be on sale for $399 for a savings of $350 and the HP will be discounted by $300 for a price of $549. The well-reviewed and full featured HP Spectre X360 will also be on sale for $949.99, brining a savings of $200. This 2 in 1 PC comes with a 5th generation Intel i7, 8GB of RAM, up to 512GB SSD for storage, and a convertible touchscreen that can be flipped all the way back into a tablet mode as the 360 degree name implies. To learn more about the HP Spectre you can read our full review here. If you are interested in a more traditional desktop PC with the latest tech and impressive styling, there is also a big discount on the Samsung ATIV One 7 Curved DP700A7K-S02US Signature Edition All-in-One. This desktop PC features a 5th generation Intel i5 processor, 8 GB of RAM, and 1TB of storage. The Full HD LED screen has an impressive curve to it with a clean rusty black look, and the all in one form factor helps reduce the clutter of cables from connecting a tower to a separate monitor. 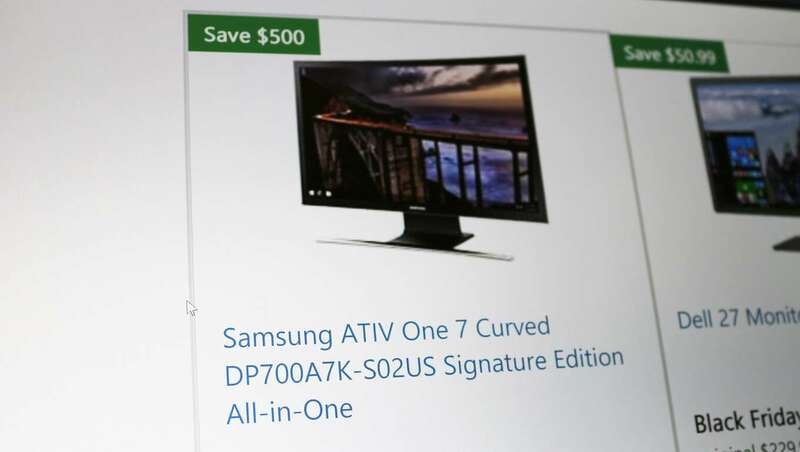 The Samsung ATIV One 7 will be marked down $500 to a sale price of $799. For those who might be curious about the new emergence of PCs on Stick (the dongles that you can stick into the back of a TV or Monitor to turn it into a full Windows 10 PC) the Lenovo Ideacentre Stick 300 Signature Edition PC will also be on sale for $69, a savings of 57%. But if you are happy with your desktop PC and are just thinking about upgrading some peripherals, there are also deals on a number of monitors. One of the bigger deals is for the Dell UltraSharp 34 Curved Monitor. This widescreen 34” monitor has an impressive resolution of 3440 x 1440, a 5ms response time, and curved panel for more immersive viewing; a perfect upgrade for your gaming rig or for the multitasker who places a premium on desktop space. 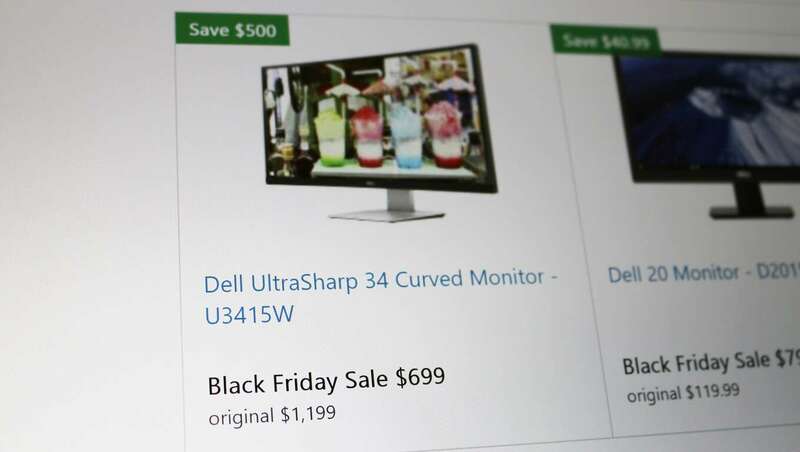 The Dell UltraSharp 34 Curved Monitor will go on sale for $699 with a total savings of $500. There are also a number of other deals on gaming products for either PC or Xbox. You can save up to $30 on Xbox One Wireless Controllers, get a 3-month subscription for Xbox Live Gold for 50%, and save 30% on Turtle Beach Ear Force Stealth 500X Headphones. There are also a number of deal on Xbox One Bundles and Xbox One and Xbox 360 games which we covered here. I know this was a long read, but it barely scratched the surface of what will be available online from the Microsoft Store starting this Thursday. So head over to their preview of Black Friday deals here to see if there is any PCs, peripherals, software, and games for you that are too good to pass up this holiday season. 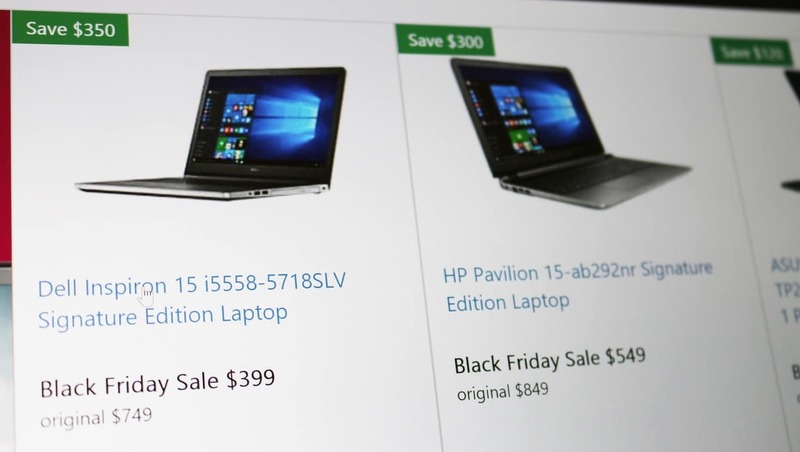 What Black Friday deal at the Microsoft Store is grabbing your eye this holiday season?